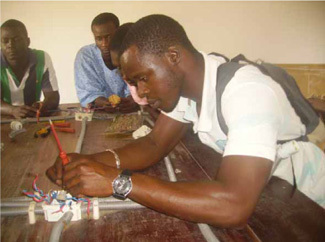 Vocational School in Bissora, in Guinea-Bissau, enables young people to facilitate their incorporation into the labor market. ADPP-Guinea Bissau, local partner of the Foundation in the country, directed the school since 1996. These young people contribute to the development of the whole community, the professions play very useful for the progress of the areas in which they live. After just over six months of the training program began in 2012, which will culminate later this year, the balance is positive, taking into account the development of the planned activities, the commitment shown by students and the multiplier effect of school the whole community. One of the fundamental pillars of the center is the training program in which they take place the following disciplines: construction, agriculture, animal husbandry, commerce and administration, solar energy, electricity and plumbing and water pumps. In total, involving about a hundred students, with the civil construction area which has more students, with 40. The duration of each program is 11 months. 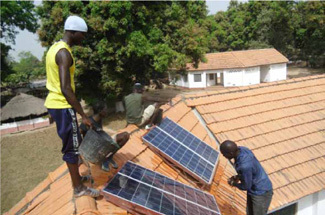 The school is also responsible for supporting the 30 students who graduated in 2011 in the fields of solar energy, electricity and water pumps. 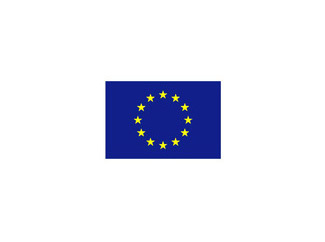 These disciplines were incorporated into the program in 2010 through the EU co-funding. Much of the set of students are women, so that the school contributes equally to female empowerment, promoting its incorporation into the labor market play professions traditionally held by men. A theoretical and practical training joins a calendar of activities that also promote the development of the whole community: food production, to raise awareness about HIV / AIDS and malaria, hygiene and waste treatment and various competitions.